Tasting “little pot” in Alhambra at Sunday Bistro. What happens when you combine slick shiitakes, moist maw of fish, slippery sea cucumber, spongy imitation abalone, and bitter mustard greens all in one clay pot? Why you get the House Special Seafood Hot Pot Deluxe at Sunday Bistro in Alhambra, obviously! This sort of hot pot is different from from a Sichuan hot pot where raw foods are dipped in a hot broth. This hot pot is more like cooking with a tajine and is essentially steam cooking. Sometimes this type of dish is called “little pot” in Chinese. Sunday Bistro’s special hot pot is designed with the Chinese love for textures firmly in mind. Most of the mouthfeeliness are not characteristics that would titillate the Western tongue, such sensations as slimy, wrinkly, and rubbery. Fish maw or the swim bladder of the fish features a multitude of wrinkles, crinkles, crannies, and folds. It is remarkably effective for trapping the hot pot’s savory brown sauce and has a resemblance to wet chicharron. The sea cucumber is not an oceanic veggie but rather a flavorless, phallic echinoderm that is prized for its gelatinous and crunchy textures. It’s also pretty good at absorbing sauce. Another prized seafood, the abalone, is so prized that it has become prohibitively expensive to include in many dishes, so an imitation substitute instead. 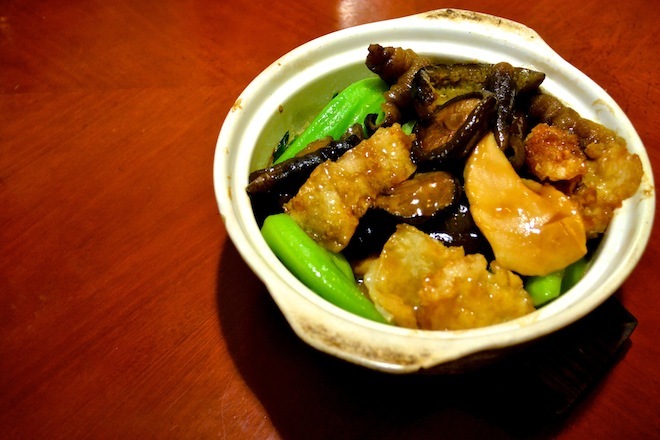 The faux abalone is chewy like a dense fish cake. It’s fishy, sweet, and helps the steamed rice go down nicely. Although this hot pot does impart distinct flavors like the mustard green’s bitterness and the shiitake mushroom’s earthy notes, the main draw here are the bold textures. So don’t expect Guy Fieri’s “Welcome 2 Flavor Town” when ordering this item. Texture-tropolis is more like it.